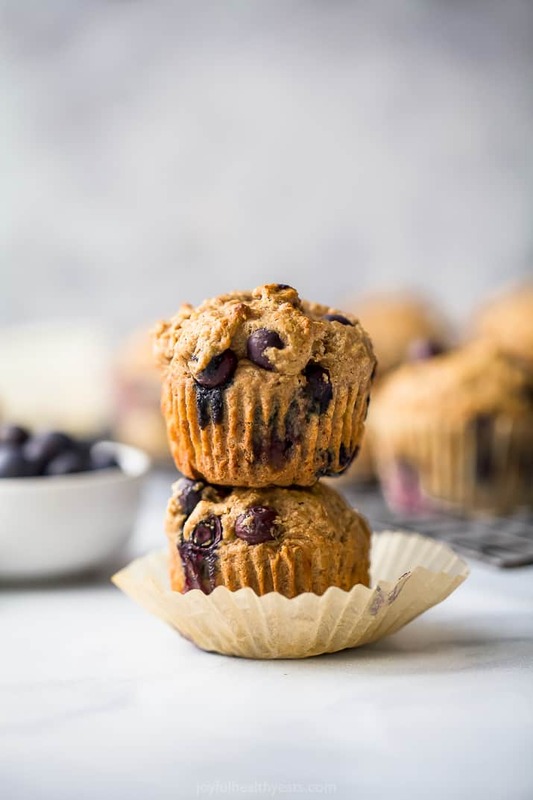 A healthy Banana Blueberry Muffins recipe that’s super easy to make! Moist, fluffy muffins perfect for breakfast or snacking. 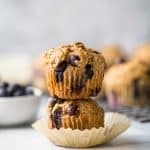 The BEST Healthy Banana Blueberry Muffins you’ll ever eat! These fluffy moist blueberry muffins are super easy. Made with whole wheat flour and naturally sweetened with applesauce, honey and bananas! 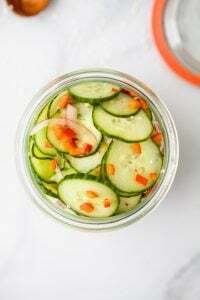 Perfect for breakfast or mid-day snack! Bah! My baby is a year! She is no longer a baby. Now she has a shopping cart, a purse and a little person dollhouse. Where has time gone? I’m even giving her big people food now. She loved the cranberry chicken salad I made a couple weeks ago, tuna, pasta sauce, nutella lava cake and these banana blueberry muffins! 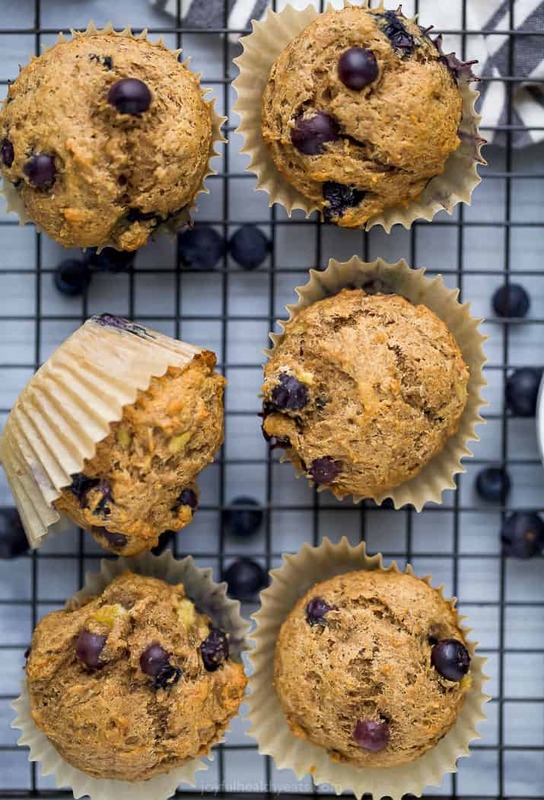 That’s right, these healthy banana blueberry muffins are Maddie tested and approved! 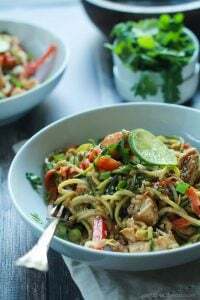 In all honestly, this was the third round of testing on this recipe. It originally started off as banana blueberry bread, but I couldn’t quite get the texture and flavor right. I usually don’t end up making something more than once, so to say I was frustrated is an understatement. 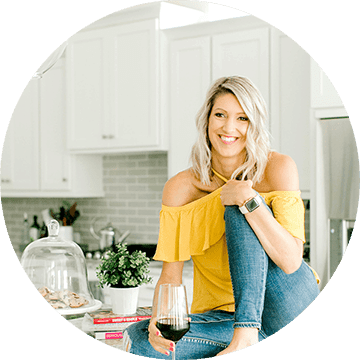 But … I am proud to say after MU-CH testing I have perfected this recipe! 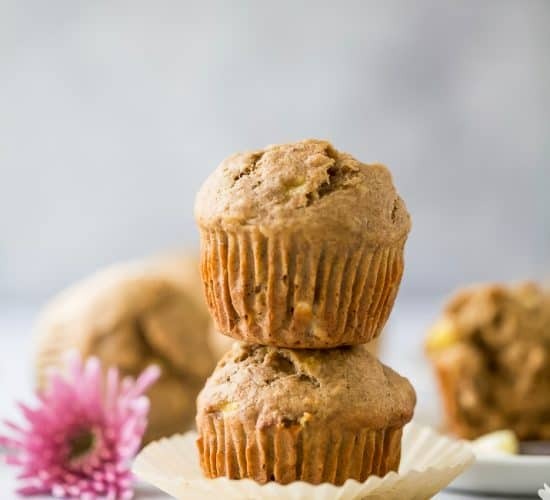 Made with whole wheat flour and naturally sweetened with apple sauce, banana and honey ensure that these muffins stay moist! 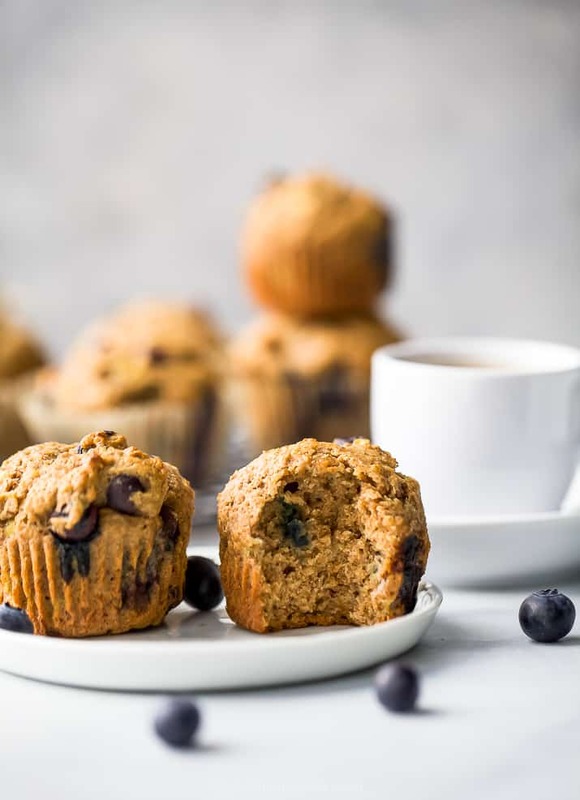 How to make Blueberry Muffins from scratch? To a small bowl add mashed banana, unsweetened applesauce, coconut oil, honey, egg and vanilla extract. 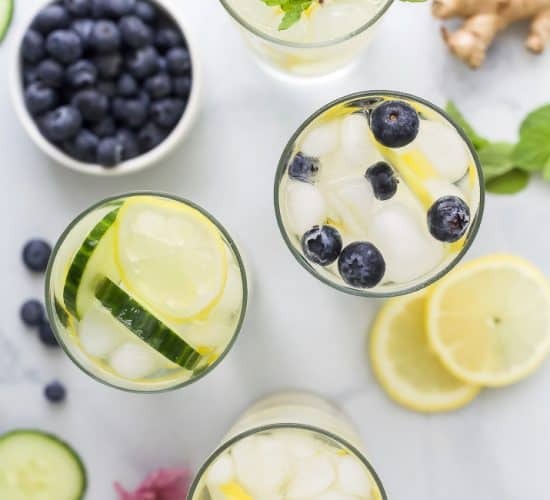 Mix together and set aside. To a large bowl add whole wheat flour, cinnamon, salt, and baking soda. Whisk together, slowly add wet ingredients to the dry ingredients. Using a spatula stir together until well mixed. To a small bowl add blueberries with 1 tablespoon of whole wheat flour. Gently toss blueberries to coat. Add the blueberries to the batter, gently fold in. Substitute honey and applesauce for white sugar. 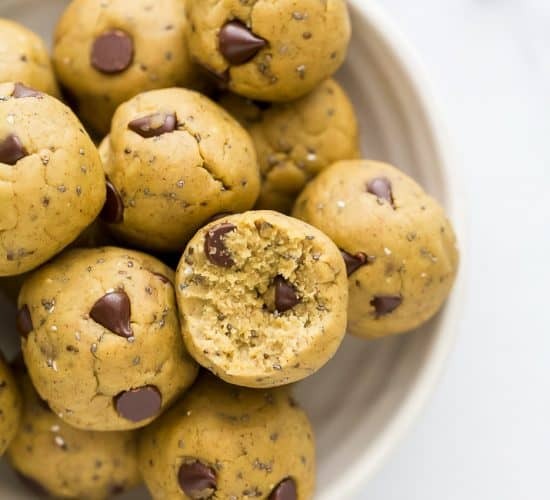 Use whole wheat flour instead of all purpose flour. Use mashed bananas for texture and added sweetness. 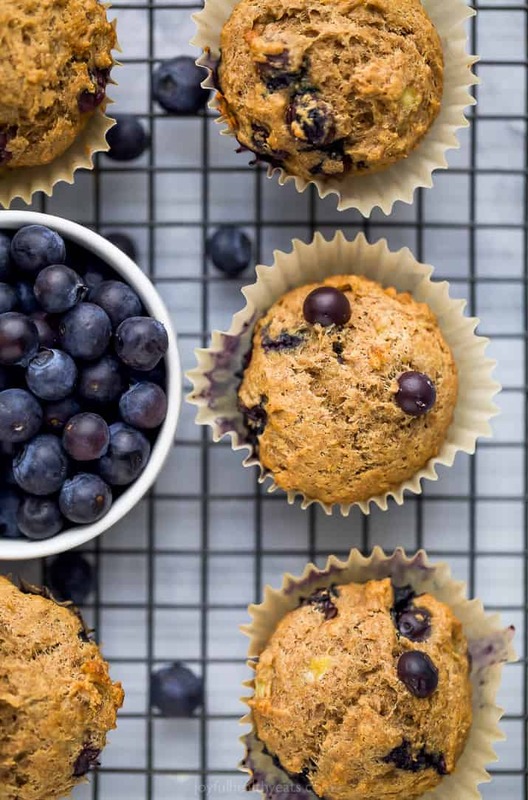 The best Blueberry Muffins for a baby or toddler? 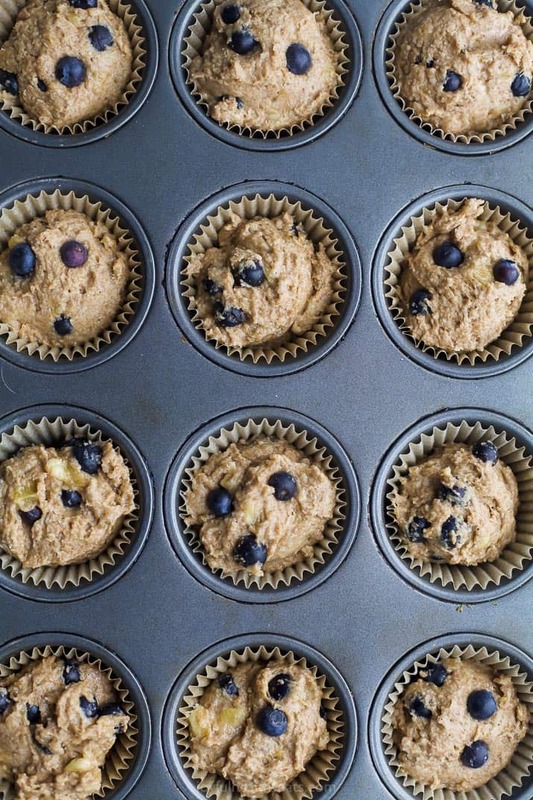 These Banana Blueberry Muffins are a great healthy muffin recipe for toddlers to start with. 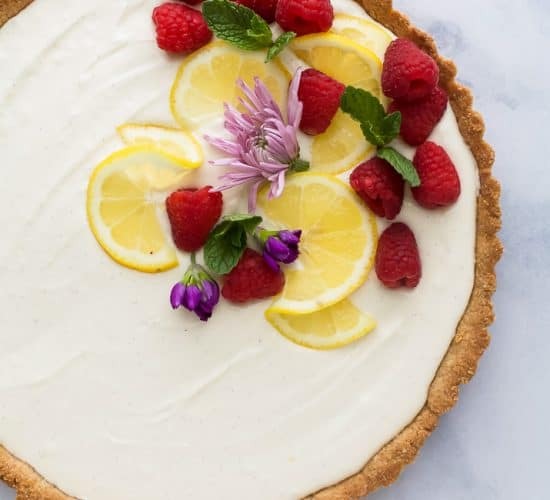 They are sweetened with natural sugars from the fruit and some honey and use whole grains. 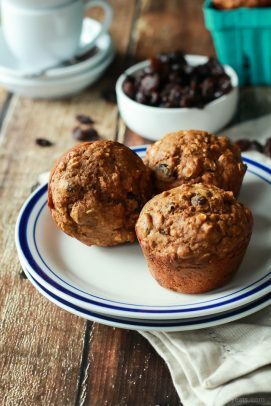 A moist easy to chew muffin that your little peanut will love! 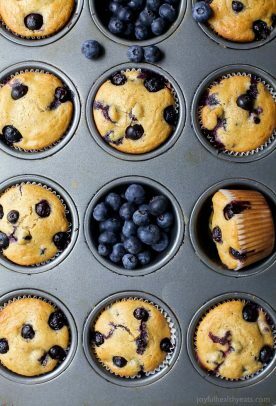 How to freeze Blueberry Muffins? Once blueberry muffins are cooled. 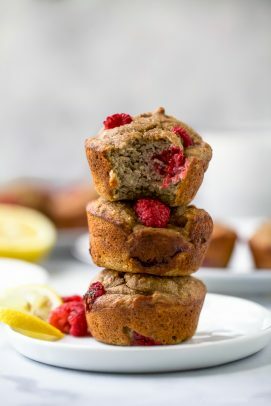 Place muffins on a baking sheet in the freezer for one hour. Remove from freezer and place muffins in a freezer safe storage bag. 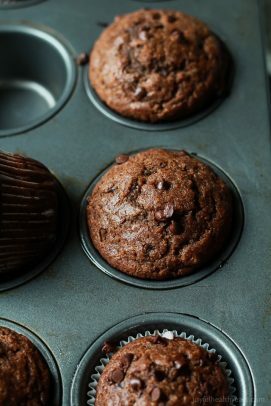 To reheat, wrap muffins with paper towel and place in microwave for 60 seconds. Serve. 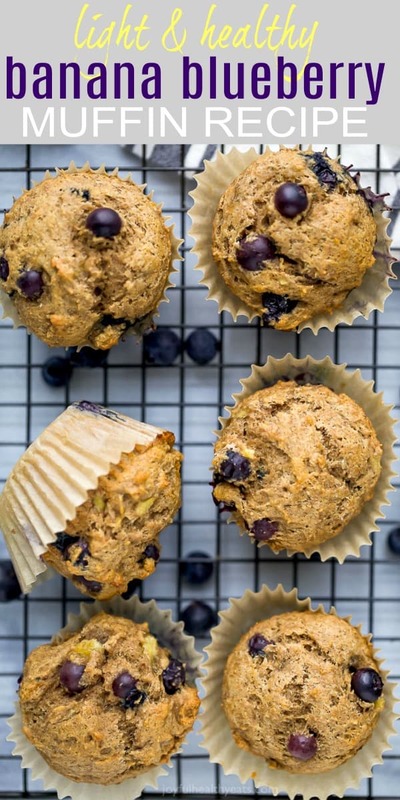 These muffins are bursting with blueberry goodness and are only 151 calories per serving! 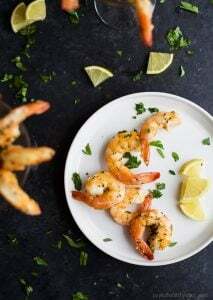 I like to top them with a little almond butter for some added protein. Cason likes them warmed up with peanut butter. 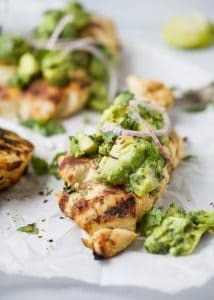 They make a great on the go breakfast if you’re in a hurry, a fiber filled food to throw into your kiddos lunch or a great protein burst for a mid-day snack! I cannot wait to hear what you guys think. Happy Monday. 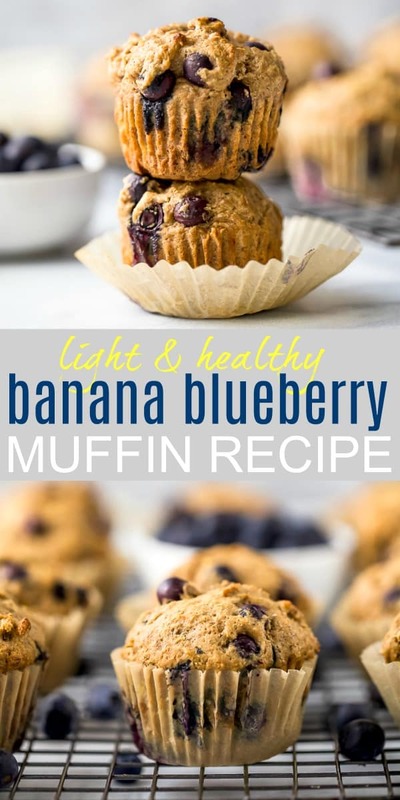 The BEST Healthy Banana Blueberry Muffins you’ll ever eat! 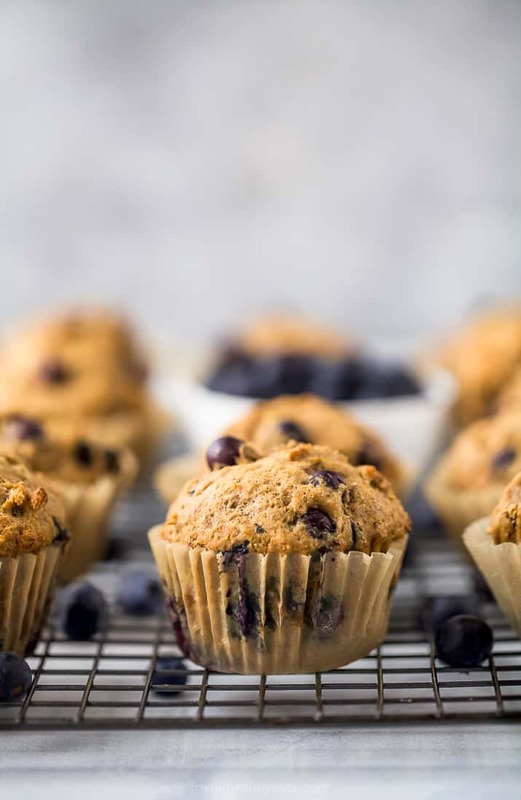 These fluffy moist blueberry muffins are super easy. Made with whole wheat flour and naturally sweetened with applesauce, honey and bananas! In a large bowl, add bananas. Using a fork mash up bananas until just very small lumps are left. Add honey, applesauce, coconut oil, vanilla extract and egg. Next add in whole wheat flour, baking soda, cinnamon and salt. Using a spatula, mix until wet and dry ingredients are completely combined! 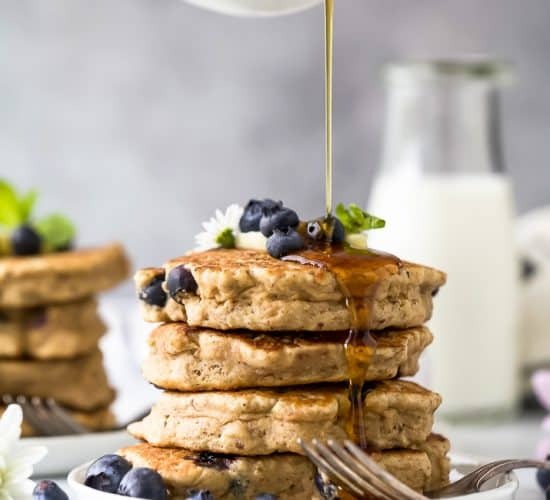 In a small bowl – combine 1-1/2 cups blueberries & 1 tablespoon of white whole wheat flour & toss to coat. Bake for 15-17 minutes, or until toothpick comes out clean. Serve.